← M-Hub, Coming on Strong in April! At our last meeting the iWizards identified a set of teachers to personally invite for inclusion on their nine project teams. 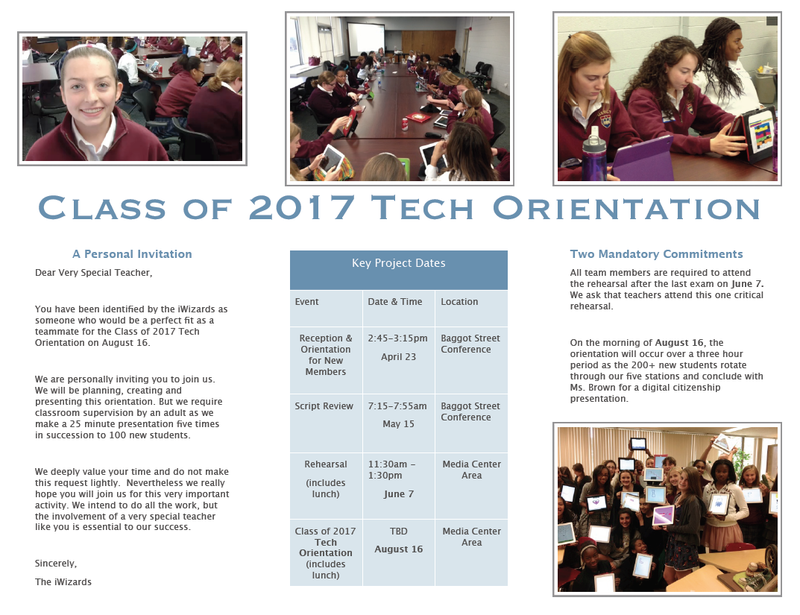 The iWizards are planning the August 16, iPad Tech Orientation for incoming students. I asked the iWizards to select the teachers who will be in charge of classroom supervision while the girls put our new students through the iPad paces. Interestingly, as the girls discussed the suitability of various teachers, the first quality they looked for was friendliness. The second most important quality was curiosity about and interest in technology. Lastly, technical competency factored into the equation. This was important, but not a deal breaker. Naturally they showed a bias toward ninth grade teachers, which is fine since those are the very teachers most of the new students will find themselves with the first day of classes. Invitations will be hand delivered after Easter Break. We hope for a high rate of acceptance.